So you have decided to buy an AED (Automated External Defibrillator) for you business, shopping centre, medical practice, school etc. That’s fantastic! The more AEDs that are available the more lives that can be saved. AEDs can help someone survive a heart attack, one of today’s commonest causes of death. The majority of those suffering cardiac arrest have Ventricular Fibrillation (VF) which is the heart beating chaotically rather than with its normal rhythmic beat. A study in Las Vegas carried out in 2000, showed that 74% of casualties in VF that were treated with an AED within 3 minutes survived. This shows that an AED close at hand in the workplace can be a real lifesaver. See our previous blog post and the Resuscitation Council (UK) publication A guide to AEDs for more about CPR and defibrillators in general. Having decided to purchase an AED, there are some things you can think about and check that will make your purchase more effective and save you money over its lifetime (cost of ownership). Most AEDs from reliable sources will probably do everything you need, but how do you check and why does it matter? Let’s consider a just a few of the things that can improve your AED purchase decision. An AED manufacturer/retailer should be able to advise on the expected life expectancy, before replacement, of an AED. It may be that purchasing a more expensive AED with a longer lifespan could save you considerable money in the long run. It is also worth checking on the expected life expectancy of batteries. These can be an expensive consumable. 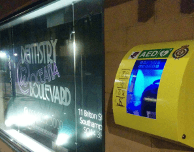 From time to time the Resuscitation Council make changes to guidelines and requirements that may need to be reflected in the software contained within the AED. Check that the manufacturer will provide these software updates in a timely manner and either free or at a minimal cost. If the AED cannot be updated or the updates are prohibitively expensive, it may result in a decision to replace the AED earlier that intended. Does the AED require regular/annual maintenance? Some AEDs require more maintenance than others, which can be both a financial and availability consideration, especially if the AED has to be returned to the manufacturer for maintenance. You should ensure that there is no chargable maintenance required during the warranty period in order to maintain the AEDs warranty with the retailer/manufacturer/distributor. Based in Scotland, we know just how variable the weather can be. If your AED is going to be based in an office environment where there are controls over the extremes of temperatures, you won’t need to worry too much. However, if you are going to site your AED in an unheated environment e.g. warehouse, garage, workshop etc. it is important that you check that the AED isn’t going to be impacted by the minimum or maximum temperatures that it may experience. As there are many AEDs available that are designed to be sited outdoors, this shouldn’t be a problem, as long as you do a quick check of the specifications. AEDs are generally designed with adults in mind. Cardiac problems in children that can be helped by an AED are relatively rare. An AED with only adult settings and pads can be used on a juvenile (by placing the pads differently). If you are a school, nursery, retail outlet, restaurant, medical practice, dentist etc. however, you may want to consider an AED that has a specific paediatric setting and comes with paediatric shock pads. Even though such circumstances may be rare, the additional cost and care in selecting a device with this functionality may be worth the additional peace of mind. Does an AED come with everything I need? Our suggestion would be to keep everything you need for CPR along with an AED. After all you are never going to use an AED on its own without doing CPR, are you? So here are a list of accessories/additional items that may not come with your AED but that you should purchase and keep alongside it. Scissors. In order to cut away clothing etc. Face shields/masks. For mouth to mouth resuscitation. Protective sterile gloves. To protect both the first aider and patient against infection. Safety razor. To shave excess hair from the chest to provide good adhesion/contact for the electrode pads. If appropriate, paediatric electrode pads and/or a key for switching between adult and paediatric modes. Strangely, even though your AED may have a Paediatric mode, it may require a key to switch modes which is not provided as standard. The following check-list provides suggestions for ensuring that the purchase of your AED device is sound both financially and from a first aid perspective. Waterproof (a water ingress protection (IP) rating of 4 or above). Can be stored and operated at the minimum and maximum temperatures expected in your environment (e.g. -10 to +40 degrees C.) and within suggested humidity levels of 10 to 95%. Has a real-time clock and/or the associated software provide the ability for events to be time-stamped. A life expectancy and warranty of at least 5 years. There is no chargeable maintenance required during the warranty period. The AED will not be unavailable for more than 48 hours for any maintenance or repair. This may be achieved via a replacement or loan scheme. The electrode pads should have a shelf life of between 24 months and 3 years from date of supply. Batteries and/or any other replaceable power sources have a shelf life and life once in the AED of at least 3 years. Can operate on battery power alone. Batteries have a minimum warranty of 3 years. Can deliver a minimum of 30 full discharges at maximum energy, on a single set of batteries. The AED including the battery, case and standard accessories is less than 4 kg. Initial analysis plus charge time to initial shock does not exceed 20 seconds. The device can store data on a PC Data Card (e.g. SD card) or on its internal memory. The device has data connectivity e.g. USB, wireless, cable, Bluetooth. Operation is simple and understandable by a non-expert. The device has biphasic waveform or a waveform of comparable efficacy. The device has an automatic discharge control to safely discharge unit if charge not used (i.e. when device charged but patient not shocked). The device can shock VF and VT above 150 BPM (adult) and 180 BPM (paediatric). The device has a low battery level alarm and/or indicator. The device can withstand daily cleaning with commonly available and non-specialist detergents and disinfectants. Software upgrades for subsequent revisions of the Resuscitation Council (UK) Guidelines and/or European Resuscitation Guidelines, are available free of charge and in a timely manner. In October 2015, the UK government Department for Education produced an AED guide for schools. Whilst, this document is specifically aimed at helping schools plan for, purchase and make use of AEDs, much of the advice holds good for any user/purchaser of an AED. Appendix A of this document contains a full specification that any AED purchased by a school must comply with. The check-list above is based on this specification and the government document contains additional detail on the items above. You can potentially* order an AED via the NHS supply chain. As at 1 October 2015 this provides an AED package at £439.49 excl. VAT (£527.39 incl. VAT) including delivery costs. the Mediana HeartOn A15 AED. *Rules in Scotland and Northern Ireland may vary. For the best chance of saving a life, take a First Aid Course. Such courses will teach you how to safely carry out full CPR, including mouth-to-mouth, and there are specialist courses that teach most effective use of an AED. There are many organisations and training companies offering First Aid Courses and one or more should be local to you. If you or you company are located in the UK drop us an email at info@indiskills.com or visit our website at indiskills.com and we will be happy to help you find appropriate courses. ← Are you using your marine VHF radio illegally?